This beautiful laid back beach town is one of the communities of Encinitas. It boasts a warm and friendly atmosphere and provides the ideal living venue for both young and old and in between. It has a population of just under 12,000 and was originally known as a farming community. Residents enjoy a moderate climate here and many breathtaking views. While each Cardiff by the Sea resident surely has their own favorites that they enjoy in this community, for surfer’s it is truly a hot spot to go to for surfing enjoyment. 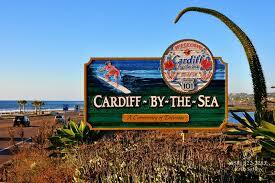 The responsibility for the educational needs of the Cardiff By the Sea residents lies in the hands of the Cardiff School District. This is comprised of two award winning schools. These ae the Cardiff School, and the Ada Harris School. The residents here are proud of their school system that has a track record for being scored amongst the top California schools and districts every year. This wonderful beach community has worked hard at building up a large offering of amenities for both residents and guests of Cardiff By the Sea. There is a wonderful selection of shops that leaves no shopper disappointed. A good selection of restaurants can be found here that offer fine dining to casual dining, and by the sea snacks whenever wanted. Cardiff has a wonderful dining and community guide that is full of tons of information. With this being a community within Encinitas the residents can enjoy all the venues offered by it. In addition though the Cardiff By the Sea has developed many other forms of ongoing entertainment with their planned events. One of their favorites is the Kook Run. There is something to be done outdoors on a continuous basis within this beach community. Of course it is a surfer’s haven and the enjoyment for these enthusiasts is non-stop. A favorite place to see is the San Elijo Lagoon Ecological Reserve. For others there are plenty of parks, and trails for hiking, walking and biking.